Tree lung wort, Textured lungwort and Yellow Specklebelly lichens growing on a maple tree along the Acacia Valley trails. 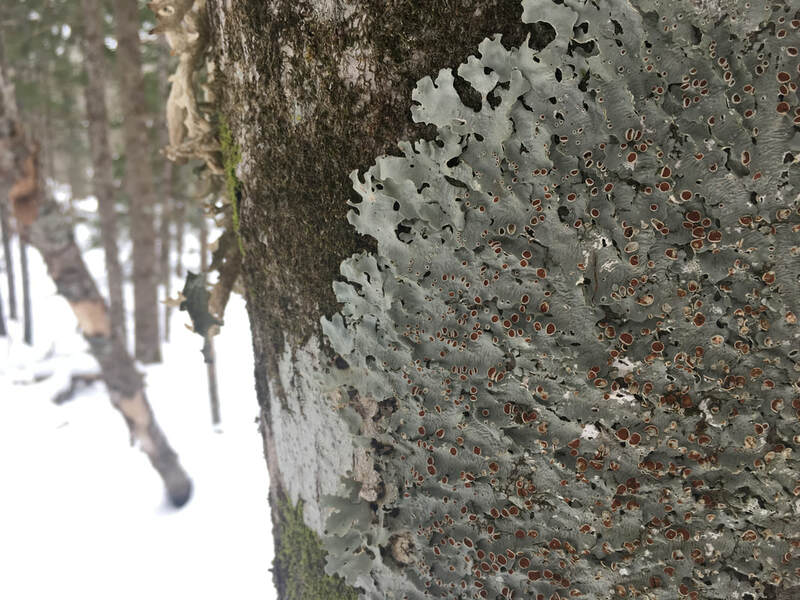 The Acacia Valley Trails are home to a wide variety of lichens. In particular the maple swamps and swales here are perfect habitat for those lichens that belong to the Lobarion, a community of big showy swamp lichens. Here we have listed ten of the more obvious ones plus one that is harder to find and is a protected species of concern in Nova Scotia. Our swamps are actually home to two species of concern, Pectenia plumbea and Pannaria lurida. For more information on lichens including a list of helpful books and online resources, see www.lichensns.com. Tree lungwort (Lobaria pulmonaria) – Large leafy loosely attached lobes with ridges and depressions resembling a lung. Bright green when wet. Textured lungwort (L. scrobiculata) – Yellow-gray lobes when dry, dark blue-gray lobes when wet, with slight depressions and ridges. 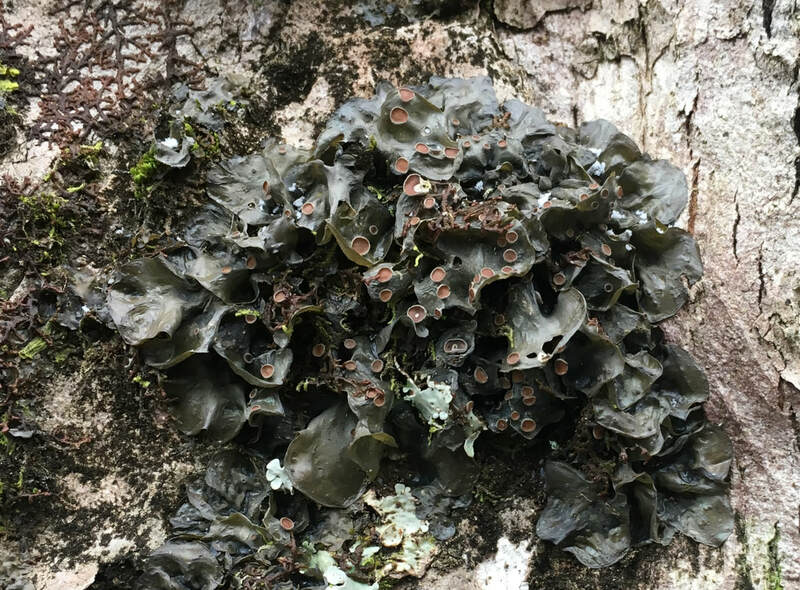 Smooth lungwort (L. quercizans) is also big and green but sticks more closely to the tree and is often covered with reddish brown buttons (called apothecia, which hold spores for reproduction). Yellow specklebelly (Pseudocyphellaria sp.) – Bright yellow sparkles on large leafy brown lobes. Bushy beard lichen (Usnea strigosa) We have a dozen or more Usneas … but strigosa is easiest to ID. Bushy bristly thallus (body) with discs at branch tip. Freckled Pelt Lichen (Peltigera aphthosa ) – There are many peltigeras. They all have thin leafy lobes and rhizines or little root like structures on the underside. Peltigeras take a lot of study to tell apart but P. aphthosa is one of the easier ones. 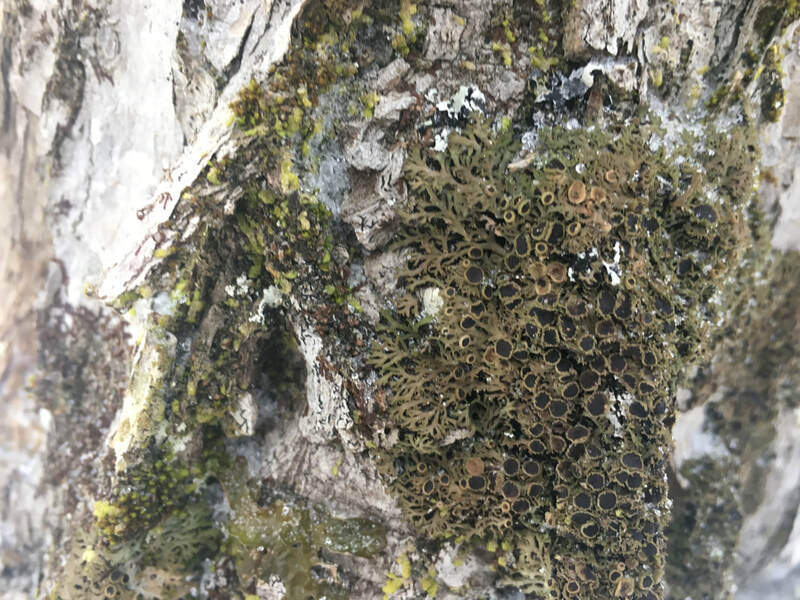 Look for big round green lobes with a freckled surface on a mossy tree base. There is another big green one called Ruffled Pelt Lichen which is, as the name suggests, ruffled along the edges. 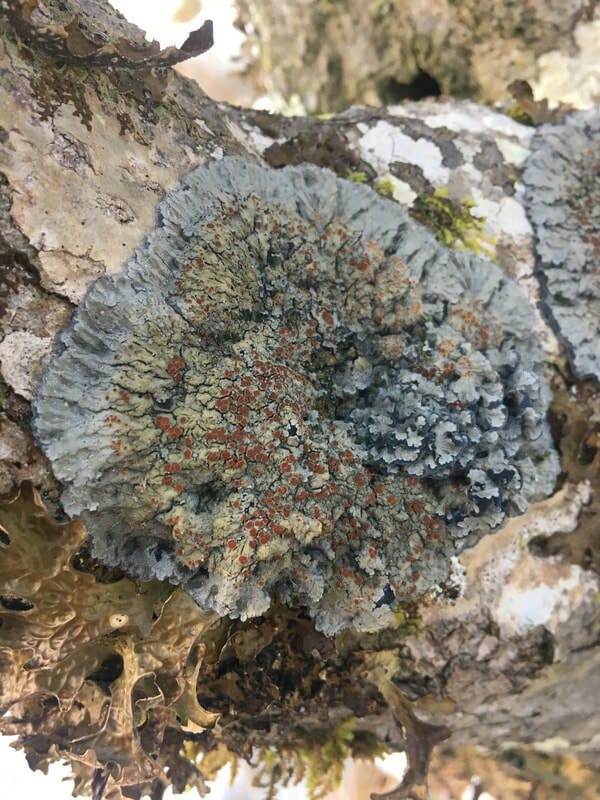 Blistered jelly lichen (Leptogium corticola) has thin thin lobes that are wrinkled and blistered and a slate gray-green thallus (body) with red apothecia (like buttons). Blue jelly skin (Leptogium cyanescens) is similar but much more common than the blistered one. It is smoother and more often has no buttons. The Blue Jelly Skin often has a grainy fuzz (called isidia) while the Blistered Jellyskin never does. Shaggy Fringe Lichen (Anaptychia palmulata) is found in Old Growth Forests (in this case Old Growth Swamps). The lobe tips fan out like a green lace with flat dark brown apothecia (buttons). The name Shaggy Rim makes sense when you look closely at the rims of the apothecia (buttons). The rims often have little shaggy growths on them. Magnifying glasses really help when looking at lichens! Mealy rimmed shingle lichen (Pannaria conoplea) These lichens are found deep in sheltered swamps. The blue gray steely colour stands out on brown maple bark. When you look close you’ll see little leaf-like lobes with a grainy covering along the edges and underneath it all, a dark dark blue furry or felty mat. Sometimes the grainy covering takes right over and you’ll see huge swaths of the tree trunk covered in a steely gray grains. 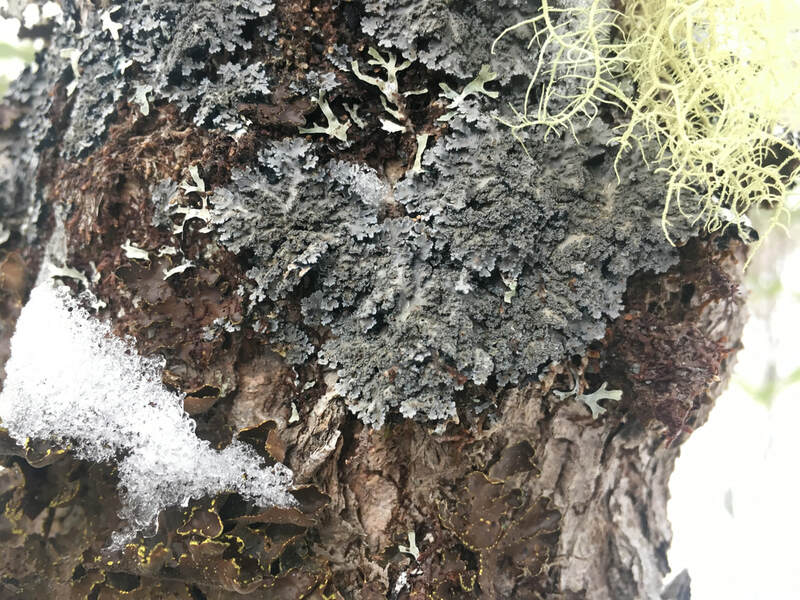 These lichens are an indicator you could be close to a Blue Felt – slow down and open your eyes wide.